Satellite geodesy also made a substantial contribution to the deepening perspective in which men could view their own planet. But the new perspective differed in an interesting way from that provided in magnetospheric physics. For the latter, rockets and satellites revealed a wide range of hitherto unknown phenomena. In contrast the subject matter and problems of geodesy were well known; it was increased precision, the ability to measure higher order effects, and the means for constructing a single global reference system that space methods helped to provide. Geodesy may be divided into two areas: geometrical geodesy and dynamical, or physical geodesy. The former seeks by geometrical and astronomical measurements to determine the precise size and shape of the earth and to locate positions accurately on the earth's surface. The latter is the study of the gravitational field of the earth and its relationship to the solid structure of the planet. As will be seen, geometrical and physical geodesy are intimately related. Geodesy offers many practical values. Accurate maps of the earth's surface depend on a knowledge of both size and shape. Into the 20th century the requirements for precision were rather modest. Individual countries could choose their own reference systems and control points and, using geodetic measurements made within their own territories, produce maps of sufficient accuracy for national purposes. The appreciable differences among the various geodetic systems did not appear to matter. As late as 1947, disagreements among Danish, Swedish, German, Norwegian, French, and English systems ranged from 95 meters to 250 meters, while in the absence of adequate surveys, errors between the various continents and  ocean islands could be a kilometer or more.31 For demands in the mid-20th century, the most obvious being those of air and, marine navigation and missilery, such errors could at times appear enormous, and there was a growing agitation among geodesists to generate a world geodetic system that would use a common reference frame and tie all nets around the world into a single system. At this point the artificial satellite appeared on the scene and was able to provide some help. To understand how the satellite could contribute, a few basic concepts are needed. The science of geodesy began when the Greek Eratosthenes (c. 276-c. 192 B.C. ), believing the earth to be spherical, combined astronomical observation with land measurement to estimate the size of the globe (fig. 36).32 He had learned (actually incorrectly) that at noon in mid-summer the sun shown vertically down into a well in Syene (now Aswan). 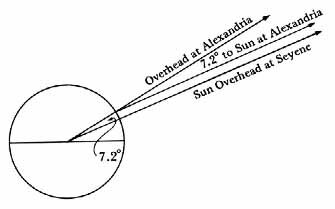 Observing that at the same time the sun as seen from Alexandria was 7.2° south of the zenith, he concluded that the arc along the earth connecting Syene and Alexandria had to subtend an angle of 7.2° at the earth's center. The arc accordingly had to be 7.2/360 or 1/50 of a total meridian circle. He was told that a camel caravan took 50 days to travel from Alexandria to Syene. Using a reasonable camel speed he deduced a length for the arc, which multiplied by 50 gave him a rough estimate (16% too large) of the length of a whole meridian circle. Such estimates of the earth's dimensions improved over the centuries as different persons used better measurements, and eventually better techniques. Figure 36. Eratosthenes' method for measuring the circumference of the earth. Figure 37. Triangulation. This technique provided a step-by-step method of accurately determining the distance between widely separated points on the earth's surface. ....value, the confidence in the calculated value of AP can be high. Jean Picard (1620-1682) employed this technique in obtaining the value of the earth's radius that Isaac Newton used in deriving his law of gravitation. The period from Eratosthenes to Picard has been referred to as the spherical era of geodesy. During that time it was assumed that the earth was a sphere. This made the geodetic problem quite simple, for one had only to determine the radius of the terrestrial sphere, and the rest came out of simple geometry (spherical trigonometry). But in the 17th century it became clear that the earth was not spherical. From this period on the earth was visualized as essentially an ellipsoid of revolution, with its major axis in the equatorial plane and minor axis along the earth's axis of rotation. 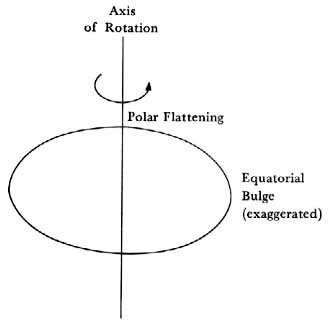 The bulge in the equatorial plane could be explained as due to centrifugal forces from the earth's rotation. Thus, the 18th and 19th centuries could be thought of as the ellipsoidal period of geodesy, and a prime task was to find the ellipsoid of proper size and flattening to best represent the earth. By the mid-20th century the equatorial radius of the reference ellipsoid had been determined as 6 378 388 meters, while the flattening-that is, the ratio of the difference between the equatorial and polar radii to  the equatorial radius-was put as 1/297.33 The tasks of modern geodesy grew out of this historical background. Those seeking a single geodetic net for the world had to agree on a suitable reference frame. It is natural to take this as a rectangular coordinate system with origin at the earth's center and three mutually perpendicular axes, one along the earth's rotational axis and the other two in the equatorial plane. Alternatively one could use spherical polar coordinates locating a point by its distance from the origin of coordinates, and its latitude and longitude. In principle all measurements and calculations could be made in terms of these coordinates without any intermediate reference. To visualize the geometry, however, a reference surface approximating the actual surface of the earth is helpful. The most useful reference surface should satisfy two important criteria. First, it should be of such a size and shape that all locations on the earth are close to the reference. Secondly, the surface should be one on which calculations of positions, angles, and distances are mathematically simple. A sphere would satisfy the second criterion very nicely, since one could use the ordinary spherical trigonometry of air and marine navigation. But for any chosen sphere, many locations on earth would be unacceptably far from the reference. By flattening the sphere at the poles, however, to produce an oblate ellipsoid of revolution, both criteria can be met. For calculations the methods of analytic geometry can be used, and an ellipsoid of the equatorial radius and flattening given in the preceding paragraph-6,378,388 meters and 1/297 respectively-provides a good first order approximation to the actual size and shape of the earth. This ellipsoid of revolution, with center at the origin of coordinates, was often used as reference ellipsoid before the advent of satellites. 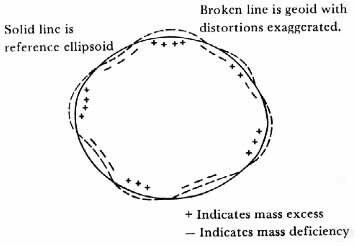 As will be seen later, satellite geodesy provided an improved estimate of the size and flattening of this reference ellipsoid. By furnishing the means of accurately positioning different sites and features on the earth, geometrical geodesy provides essential data for map makers, the fixing of political boundaries, civil engineering, and military targeting. But, the data also raise numerous scientific questions, such as why various features are where they are and what forces cause observed irregularities in the shape of the earth. Dynamical geodesy addresses itself to such questions. Among the factors affecting the shape of the earth are the distribution of matter in the crust and mantle, centrifugal forces due to the earth's rotation, and gravity. The dominant factor is gravity, and an investigation of the earth's gravitational field lies at the heart of dynamical geodesy. To understand why, the concepts of geoid and spherical harmonics will be helpful. First the geoid. To start, consider a simplified case. Suppose the earth to be perfectly homogeneous, plastic, and nonrotating. Then the earth would assume the shape of a perfect sphere (fig. 38). 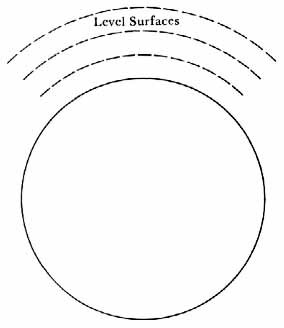 More significantly,  level surfaces around the earth would also be perfect spheres. By level surface is meant a surface to which the force of gravity is perpendicular everywhere. At any point on the surface the bubble of a spirit level held tangent to the surface would be centered. A pool of water on a level surface would experience no sidewise, or "downhill," gravity forces urging the water to flow (and were it not for internal pressures in the water and adhesion to the material of the surface, the pool would stay where it was). The level surface that coincides with the actual surface of the earth is called the geoid. In the idealized case treated here, the geoid is a perfect sphere. Now suppose a homogeneous, plastic earth rotates around a fixed axis. In this case the centrifugal forces of the rotation combine with gravity lessening the gravity and causing a bulge at the equator and producing a flattening at the poles (fig. 39). The earth's figure becomes that of an oblate ellipsoid of revolution, the surface of which is level. If the surface were not level, sideways forces on the plastic material would keep the material flowing until those forces were reduced to zero. Thus, for this case, the geoid is the ellipsoid of revolution comprising the earth's surface. Figure 38. The geoid in the case of a homogeneous, plastic, nonrotating earth. For the idealized case depicted here, the geoid is a perfect sphere. Figure 39. The geoid in the case of a homogeneous, plastic, rotating earth. In this case, also an idealized one, the geoid is a perfect oblate ellipsoid of revolution. ....thus forming a bulge. In a similar vein, near a mass deficiency, the level surface would show a depression. Figure 40. The geoid in the case of a nonhomogeneous, nonrotating earth. Variations in the earth's density generate bulges and depressions in the geoid. Figure 41. The actual geoid. The real earth's geoid has numerous bulges and depressions, revealing by their existence appreciable variations in the material of the planet. ....features are revealed in their influence on the earth's gravitational field, intensifying the field near mass excesses and weakening it near mass deficiencies. These perturbations in the earth's field produce corresponding perturbations in the orbits of satellites which revolve under the influence of gravity. A precise analysis of these orbital perturbations can yield the features of the field. From these one finally gets back to the geoid and the earth's structure. Mathematically the earth's gravitational field can be derived by calculus from what is called the geopotential function psi [Greek letter]. Physically the surfaces over which psi [Greek letter] is constant are the level surfaces discussed earlier in defining the geoid. Thus the makeup of the geoid and that of the earth's surface geopotential are identical. The geopotential function can be expressed as the sum of an infinite number of terms (in general). Because these terms can be expressed in sines and cosines of latitude and longitude, they are referred to as spherical harmonics, by analogy with the harmonic analysis of a vibrating string where sines and cosines of the various multiples of the fundamental frequency of the string are used. * The amount of a specific harmonic in the expansion of the geopotential is given by a coefficient Jnm. The most general harmonics correspond to distortions of the geoid in both latitude and longitude. Some, called sectorial harmonics, reveal major distortions in longitude for example, an ellipticity in the earth's equator. Of special importance are the zonal harmonics, which correspond to coefficients Jnm for which m = 0 and which depend only on latitude. The second zonal harmonic corresponds to the earth's equatorial bulge caused by the earth's rotation. The third zonal harmonic, if present in the expansion of the geopotential,  would add a pear-shaped component to the earth's figure, elevating the geoid at one pole and depressing it at the other. It was in regard to the reference ellipsoid and the coefficients in the spherical harmonic expansion of the earth's potential that satellite measurements could aid the geodesist. The most straightforward contribution was to provide a sighting point in the sky that could be used to make direct connections between remotely separated points of the earth, supplementing the method of triangulation along the earth's surface. For this purpose simultaneous sightings of a satellite from two widely separated points were most useful. But once the orbit of a satellite had been accurately determined, simultaneous sightings were not required. One could relate separate sightings by computing the time and distance along the orbit from one sighting to the other, and again proceed to compute the distance between the two observing stations on the earth. By this latter method continental and transoceanic distances could be spanned, clearly a powerful aid in tying together different geodetic nets of the world. The second major contribution that satellites could make was to help determine the different harmonic components of the earth's gravitational field, or alternately of the earth's gravitational potential. The orbit of a satellite is determined completely by its initial position and velocity and the forces operating on it. These forces include the gravitational influences of the earth, sun, and moon; atmospheric drag; solar radiation pressures; and self-generated disturbances such as those caused by gases escaping from the interior of the satellite. For a satellite near the earth yet well out of the appreciable atmosphere, the earth's gravity controls the orbit, the other effects amounting to corrections that have to be taken into account. As for the earth's field, Newton's inverse square law term constrains the satellite to an essentially elliptical orbit. But higher order terms also have their effects. The second order zonal harmonic or equatorial bulge causes the plane of the satellite's orbit and the line joining apogee and perigee to rotate in space. Still higher harmonics produce slight undulations in the satellite's orbit, which can be measured and analyzed to determine which harmonics, and how much of each, are producing the observed effects. The application was simple in principle, but mathematically very complicated. Satellite orbits and their perturbations were directly related to the geoid, while the positions of the tracking stations and geodetic nets were tied to the reference ellipsoid, and a major objective was to improve the quantitative definitions of both geoid and ellipsoid. Because of the complexities, the modern computer was required to take advantage of the satellite opportunities. But with the computer the complexities and important results were quickly sorted out. Figure 42. The geoid as revealed by satellite measurements. ....C. A. Wagner of data from the communications satellite Syncom 2 in synchronous orbit over the earth's equator.39 Wagner found a difference of 130 ± 4 meters between the major and minor equatorial diameters, with one end of the major diameter at 19° ± 6° west of Greenwich. * More completely, like the sines and cosines, the basic functions out of which spherical harmonics are constructed form what mathematicians call an orthogonal set.